It’s getting close to decision time for the Nebraska coaches. Following Sunday’s scrimmage inside Memorial Stadium, the new staff has its first real evaluation tool. “So far it’s been a pretty flowing depth chart – we’ve just been giving guys reps with the ones, the twos and the threes whether they deserved them or not just to kind of see – and that was kind of the first time we’re making evaluations and saying: ‘Hey, now we kinda know where he belongs,’” defensive coordinator Erik Chinander said Tuesday when he met with the media. Throughout camp, there hasn’t been much one-versus-one competition. The coaches got to see exactly that Sunday and decide whether those ones deserved to stay ones. Asked who specifically performed well, Chinander said a lot of guys “played really well” but singled out a few in the front seven. For the most part, those are the names that keep popping up in fall camp. The trio at inside linebacker seems to have solidified themselves at the top of that group for coach Barrett Ruud. Ferguson continues to garner praise and the typical refrain with Gifford is he’s still getting his “sea legs” back. “I don’t think there’s a guy right now that we’re saying: ‘you’re irreplaceable, you’re a one, have a good day,’” Chinander said. “There’s none of those guys out there right now but there’s definitely a few guys moving to the top. >> There was a noticeable shift in the tenor of practice immediately following the Friday visit from former Blackshirts Grant Wistrom and Jason Peter. Chinander said the atmosphere in the room Friday was tense at first, but once the offense left the room and Wistrom and Peter focused on the defense, things picked up. 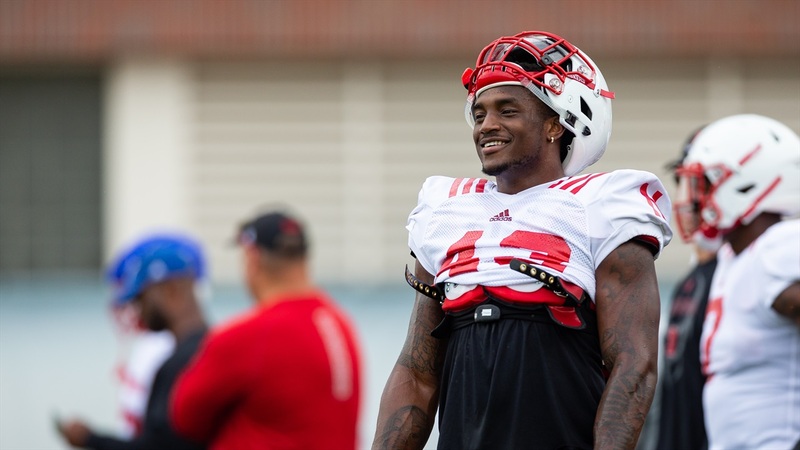 Chinander said it’s important to him to bring in past guys to speak on the Blackshirt tradition because, as he says, “I think the Blackshirts is the greatest tradition in all of college football,” but it’s not his. You can read more about the meeting here and here. >> Defensive backs coach Travis Fisher said safety JoJo Domann is close to the top of his production chart for the safeties and cornerback Braxton Clark is rising fast. >> Tre Neal, the recent UCF graduate and safety, asked to be put on both special teams units when he arrived. “That's what made our team at UCF last year so great," Neal said. "Once we started to understand that we needed to compete on special teams, that's when we took the leap from that 6-6 to 13-0." Special teams coordinator Jovan Dewitt said Barret Pickering has separated a bit at placekicker, Caleb Lightbourn is solidified as the kickoff specialist and Maurice Washington is working as a return man, among others. Jacob Padilla will have more on that unit later. >> Outside backer Breon Dixon, while talking about what drew him to Lincoln, could not stop smiling about the fanbase. Dixon wasn’t recruited by Nebraska out of high school but Dixon said linebacker Mohamed Barry (a Georgia native same as Dixon) was in his ear quite a bit. He also added that the last staff didn’t “reach out to anybody that was big time in the South.” That has obviously changed under Frost. In the 2018 class and so far in the 2019 class, Nebraska has commitments from 14 kids from SEC country.